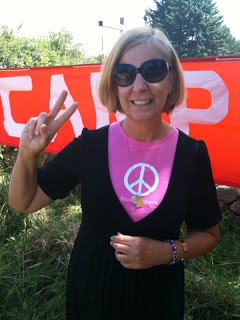 Owl Creek Gazette: Cindy Sheehan and the Tour de Peace are Coming to Greenville! Cindy Sheehan and the Tour de Peace are Coming to Greenville! We are pleased to announce that Cindy Sheehan and the Tour de Peace will be in Greenville, IL on Sunday, May 26th to join us for our monthly Peace Vigil on the corner of 4th and Franklin Streets from 1pm-2pm -- Everyone is welcome to join us for this event! For more information on the Tour de Peace and Cindy's insightful words on Matriotism, check out page 9 in the May issue of the Owl Creek Gazette via our Current Issue page.